Around a month ago, Already Dead Tapes and Records released an album that I was really interested in but only got to check out now. This album is Dromedaries by Neuringer / Dulberger / Masri. I've seen Shayna Dulberger play with Cellular Chaos, so I wanted to see what she would do here. I like these kinds of collaborative experimental albums. I love the art on this album. After seeing the names involved, this is what drove me to listen to it. The beautiful blue nightshade of what looks like North Africa is a trip. The position and font of the text is well done as well. There is a mysticism and mystery to this cover art that calls to the subconscious mind. 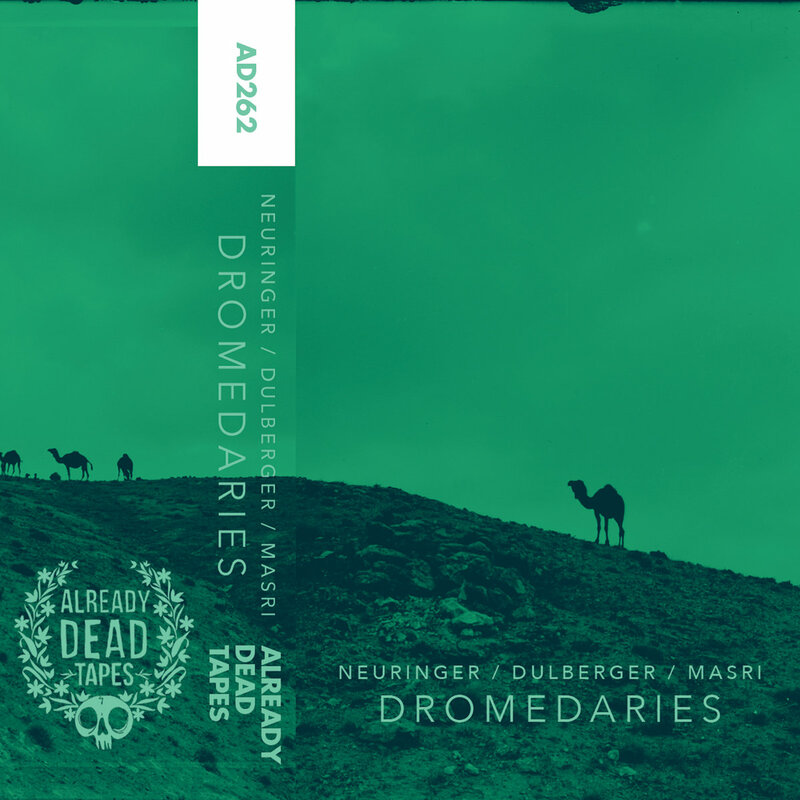 Dromedaries starts with some semi-tropical drums beating to a quick and frantic pulse of bass and saxophone on "Passage To The Spine". The track gets more unsettled as it goes, transporting from cool rhythms to dangerous acid visions of heat. The heat clears at the end with a minimalist bassline and little else. "One Foot Lighter Than The Load" has a ping-pong sound, one instrument in and another out. I like the drums on here a lot; they have a watery deepness to them like the farthest depths of the ocean where strange prehistoric beasts still dwell, a place I have visited in my nightmares. There's an amazing mid-section with really wild horns that starts with a long drumroll tense up. "As Is Above, So Is Hello" has a rainy sound, and this would be a good rainy day record. A sweeping dusty sound and a slowly sounding horn arise from ancient texts; it suits the witchy title. This turns into a more reflective piece, Nighthawks at the Diner, a mythos detective going over what he saw in that tomb under the strange hospital as he stirs his glass furiously and awaits the open-face roast-beef sandwich he ordered. Even the waitress's beauty couldn't get his mind off those foul odors of mildew and honey and the arcane symbols written on the walls in blood. This track really takes my mind to the lonely corners of the night. "A Horse By Committee" comes in strong with strings being roughly bowed, bells, and a steady beat. The horns float around like little ghosts, orbs and bugs and things. It's a fast-moving track and the longest on the album. There are some strange winds or bird sounds or maybe people on a roller-coaster in the middle of the track that threw me off for a second. Then there is a deep and eerie drone on the strings that stands alone for a time before splintering into wild sounds and then a sound like someone drawing with chalk arises in the West (aka the left-side). The whole track transforms into clockwork tinkling and rustling bass like some old, crumbling magick shop. This is such a great track that takes me all over. The last track, "Age of Reprisals", starts with some crickety, night sounds, and then there is a major rustling in that night with crashing cymbals, ringing metal, and harsh rattling and whirring. I think some of these are windup toys. It even sounds like there is a harmonica. The instruments here are really varied and add so much. This is a much calmer piece with little pops, cracks, distant thwomps, and bells. It's spooky, eerie, and unsettling. It made me feel a little sick, recalling yesterday's food poisoning and last weeks' toothaches. It ends on a rhymic clacking and chimes somewhere in a cavern with waterfalls and petroglyphs. It's a perfect end. Dromedaries was a surprise; I didn't expect a free-jazz album, and this one goes into really interesting spaces. The blue tint of those scrublands matches the tales told in these songs. The production is not harsh and gives the musick space to meet the loneliness of this blue sphere, as jazz is wont to do. When it's not going into a mystic otherworld or a late-night diner on the shores of the Nile, the album also knows how to rock and skronk. This trio has not set their work into a formula. Talking about these diners and Egypt and lonely nights makes me think of the old ballad, "You Belong to Me", which matches this song in a way that I can't really explain, a song I associate, like this album, with a strange cosmic terror (though that one is buried behind a few other surfaces). If you are a fan of no-wave and free jazz, Cold Bleak Heat and various Sonic Youth solo weirdness, this is for you. Dromedaries receives a Good.